What About The Lost Jobs? 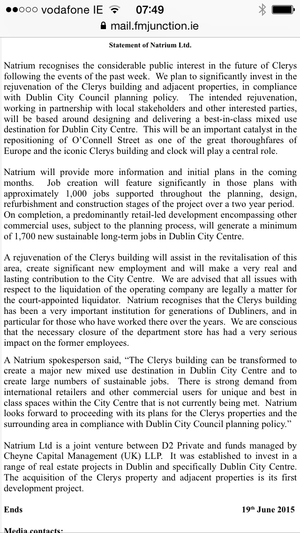 A statement from Natrium – the new owners of Clerys – issued this morning. Previously: Where Will We Meet? Meanwhile, On Harcourt Terrace Ireland’s First Viral Ad Meanwhile, In O’Connell Street Where Will We Meet? 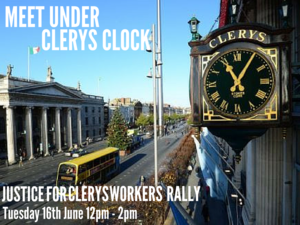 Posted in Misc and tagged Clery's, Natrium at 9:24 am on June 19, 2015 by Broadsheet. Something very reassuring about that full battery icon. So they are closing down a big retail operation to open a big retail operation. Makes sense. Out of curiosity, roughly what were the lifer retailers earning? Why, out of curiosity ? Was it out of line with other retail companies that are able to continue trading? 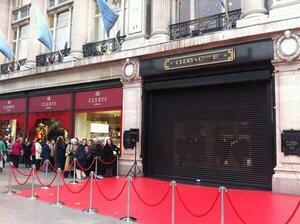 Aren’t they closing down a failing retail operation in order to open a new retail operation? I don’t think there was ever any doubt they were planning on making a fortune out of the place. That’s not reassuring to all the people who are now out of jobs. So it wasn’t the sale of a company so much as a land grab. My question is how much did this company pay for the company/building? And how much is the building independently valued at? Why do I get the feeling Natrium managed to get the building at fraction of it’s true value. They neither need nor give a shite about goodwill. They are going to hire 1700 new staff? Could they not give the old staff back their jobs or priority? What the ones who helped it become the dump it was. I’m sure they will be blacklisted and rightly so. They milked it for years more like. Management were sacked as well. 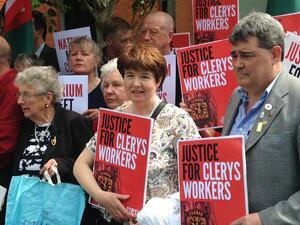 Are you only supporting the lower paid staff in Clerys? Bloody marriage referendum and [REDACTED] events have sent a lot of journal.ie commentators to this site. A pity, it’s become a lot nastier in the comments section since. Would the marriage referendum coverage not have brought a more left-wing crowd in, no?